The Harleminster Ballet School is located in a quiet, rural area of England and everything is peaceful until the sudden arrival of three mysterious girls. The girls surprise the headmistress by already being in school uniform, the school does happen to have three vacancies but it is a most unusual way of joining. Another surprise is, despite the looking identical, they say they are not related and introduce themselves as Jean Smith, Mary Jones and Ann Brown. The headmistress takes them to meet the other girls in their class. On questioning it seems they never danced before and say they wouldn’t know their previous school. The other girls find them weird and creepy. Ursula is to take them to their dorm and it is there the girls first show their unusual powers. Mary starts having fun with a plant, it suddenly grows and attacks Ursula. Luckily she is stopped by the arrival of the headmistress and other girls. But when the headmistress confronts them, she is stopped in the middle of her speech and then collapses to the floor. The Strange Ones have used their powers to make her blind. It is clear now that they are dangerous people. They will not say what they want with the school, but they can undo what they have done if they wish, but no one must attempt escape or try to contact anyone. The school is the carry on as normal per the Strange Ones commands and the girls despite no ballet experience make remarkable progress. The other girls in the school are naturally terrified of them. While talking with a teacher, Miss Lennox, they make a plan to contact the police, unfortunately not knowing that telepathy is another of the Strange Ones powers. Miss Lennox tries to leave and contact the polices but the Strange Ones attack her with a plant. It completely envelops her and when the leaves fall away she looks like one of the Strange Ones. According to the Strange Ones is just in appearance and the unconscious Miss Lennox is taken to bed. The girls in the dance class are upset by these events, but they must continue to follow the Strange Ones demands that the class must go on. One girl wonders why ballet is so important to them. Later the Strange Ones are shown around the grounds. They come to a churchyard where famous ballerina Juliana Tanfield is buried there, using their powers again an apparition of Juliana appears and dances. The Strange Ones are not pleased to see an arrival (a delivery man) at the school, but they turn it to their advantage. They give the man super strength and command him to guard the school. Of course when the delivery man doesn’t return this attracts the attention of the police. When they come to the school to investigate, they are chased away by the man and they go to get reinforcements. The Strange Ones are confident in their powers, so they are not worried about this. When the army arrive the Strange Ones have set rods around the school which the army cannot pass. Meanwhile the girls have come up with a plan, after talking to the Strange Ones partially in Latin, they discover dead languages mean nothing to them, therefore they can use it to shield their thoughts. But the Strange Ones won’t be defeated so easily, they force one of the girls, Maria Blake, to tell them what language they are using. They also allow Maria to escape as the figure they can use her to set a trap. Four other girls have used an old tunnel to try and contact the army, not knowing that the Strange Ones have now learned Latin and are aware of their movements. When they emerge from the tunnels, they are shocked to find they look like The Strange Ones. The army are about to arrest them, despite their protests, until Maria Blake sticks up for them as there are four of them they must be telling the truth. Unfortunately, once the army have let down their guard the Strange Ones take over the girls, making them attack. Then leaving the army unconscious they head for the town, to also attack them. Maria seeing everything, follows the girls into the town where they wreck havoc. She notices that the girls stick together and following that hunch, she manages to separate one from the others and all four collapse. She then goes back to the school with this knowledge. While dancing, Maria partners with a Strange One, while repeating a multiplication table in her head she maneuvers the girl out the door and locks her out. She tells the others to grab the other Strange Ones and with them now powerless they demand an explanation.Having no other choice they tell the class they come from the planet Talmar which is at war with another planet, Kotil over possession of a third planet, Gald. The opposing planets had agreed to fight a “war in the arts” the winner getting Gald. The Strange Ones had been sent to learn ballet for this war. They agree to reverse what they have done and leave peacefully once the three are together again. They keep their promise but leave with the ominous words “someday our planet may need earth – then we will return”. This is possibly influenced by the 1957 novel “The Midwich Cuckoos” by John Wyndham. 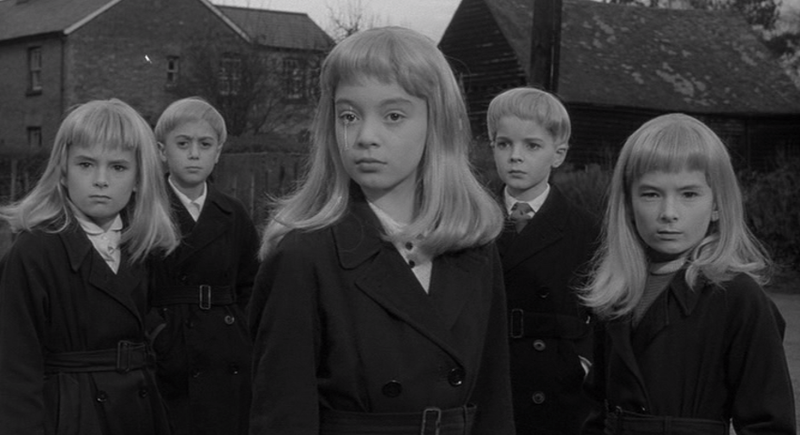 It’s popular film adaption “Village of the Damned” came out just a few years prior to this story and I can see some similarities. Both take place in an isolated British town, feature strange children, who look alike with their platinum blonde hair and have incredible mental powers and an unknown agenda. The Cuckoos/Strange Ones, always stay in a group, act in a very cold, matter of fact way showing little emotion and unnerve those around them. It is not the only time The Midwich Cuckoos would influence a comic book, in Grant Morrison’s X-Men run he introduced “The Stepford Cuckoos” a group of five telepathic girls. Perhaps, Morrison was even familiar with “The Strange Ones”. Although the story had 12 episodes it is actually quite short as there was only 1 page per episode. As the events are meant to take place over a short period of time this works to it’s advantage. Things move along quickly, after the first episode the Strange Ones pretense of being “normal” students is dropped. Once they reveal their powers, they are not referred to by their “names” just as the Strange Ones. While we see reactions of the schoolgirls and them trying to come up with plans, there isn’t really a protagonist against the girls until Maria, who isn’t named until over half ways through the story. This works fine as it keeps the focus on the Strange Ones. There is great imagery throughout, capturing the eeriness and formidable powers of the girls. There is also good use of colour such as the yellow in the panel below, I particularly like the panels where the girls use their powers from a distance. I only have the Spellbound version but I would guess the original in Diana would have been even more impressive with it’s glossy paper. It is understandable why the school girls find them creepy and are frightened. The ending leaves a lot of questions, I am curious about these warring planets and is the prize, Gald, an occupied planet that they will overthrow? I would also like to see how this “war of the arts” went, who won, wheter the winning planet would want to expand the number of planets they own and is Earth in danger? Especially with the Strange Ones parting words, which could be seen as a warning or possibly they may need help against a bigger threat! The Strange Ones are true to their word reversing what they have done so maybe Kotil is that bigger threat! I think the mysterious ending works in keeping in tone with story. Sally and Jenny Buchan were twins. Following an accident, which Jenny believed was her fault, Sally had lost her power of speech and become very nasty. Jenny used a telepathic link that existed between the girls to speak for her. But now, Sally could force Jenny to behave badly, too, and Jenny had become very unpopular at their boarding school.